Kenya’s National Energy Policy is designed “to facilitate provision of clean, sustainable, affordable, reliable and secure energy services at least cost while protecting the environment.” The efforts come alongside a critical time for Kenya – economic growth and energy demand are higher than ever. The current supply, although increasing slowly, cannot keep up with demand. In response, the Kenyan government is using three policy tools to facilitate the adoption of renewable energy. The aim is to increase the country’s energy supply, close the demand gap, and ultimately enable economic growth for Kenya. At Invested Development, we’re interested in seeing what this means for the market, the customers, and the smaller players – the kind we like to invest in. Less than 20% of the total population and 5% of the rural population in Kenya has access to electricity (World Bank, 2009). As mobile technology becomes a part of Kenyan culture and Nairobi positions itself as the technology hub of East Africa, demand is growing fast for electricity from both on- and off-grid consumers. Evidence of this includes frequent rolling blackouts due to insufficient supply and the growing popularity of off-grid solutions such as small-scale (<20 Watt panels) solar home systems. 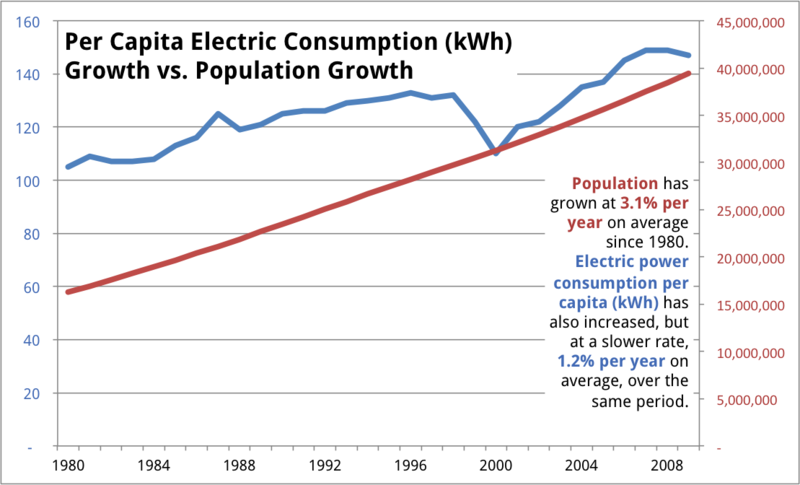 Although overall electric production has increased at 5% per year since 1980, consumption of electricity per capita has only increased at 1.2% per year (World Bank, 1980-2009). This is a result of the growing population and the inefficiencies that exist on the grid: transmission losses, theft, undiversified sources, and prohibitively high costs for infrastructure development. The population is growing at 3% per year on average (with a growing youth demographic on mobile phones to boot). A significant increase in the country’s energy supply is necessary in order to keep up with demand and continue to increase per capita electricity consumption. 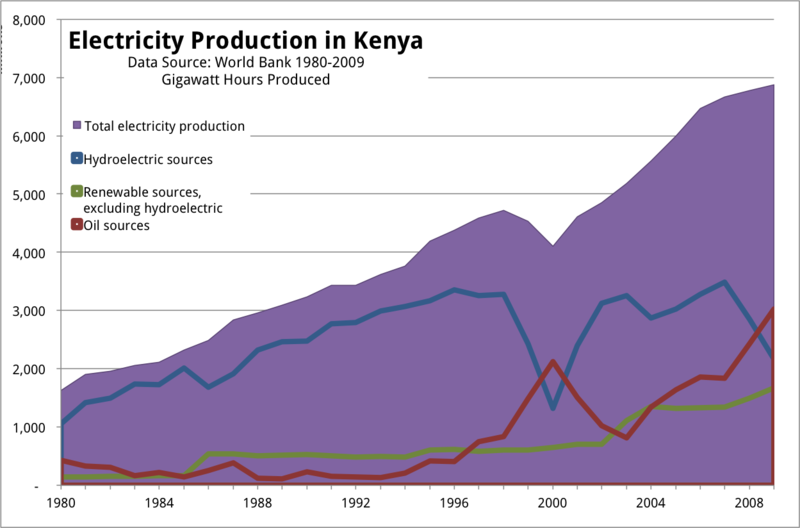 Historically, Kenya has been dependent on hydroelectric sources of energy; at its peak, it supplied over 80% of the country’s electricity. Since the late 1990s, however, hydroelectric production has been unstable and even declined in recent years. Although a renewable source, relying on hydroelectric is risky in areas prone to devastating droughts, Kenya and its neighbors included. East Africa is becoming increasingly vulnerable to climate change and the reliability of hydroelectric as a primary energy source is insecure. 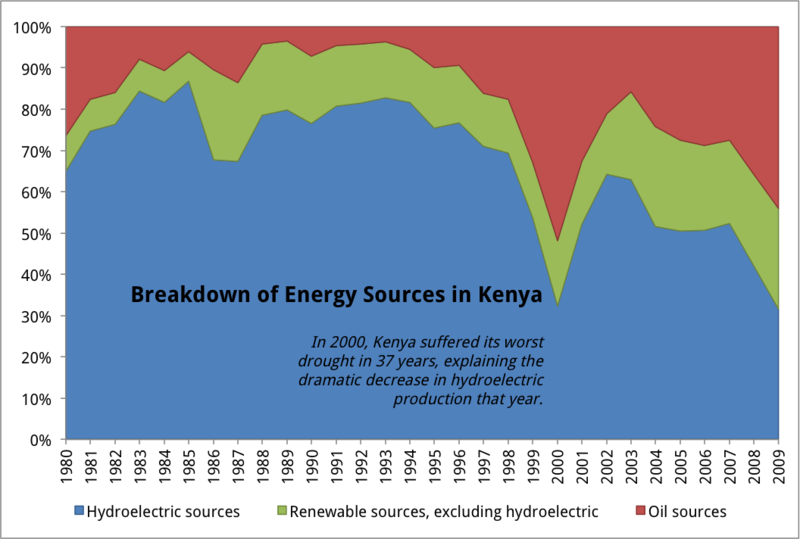 Kenya has two other options: oil or renewables other than hydroelectric. Production from each source has increased over the last decade, however oil is a short-term solution while other renewables are more sustainable. Oil was a key substitute during the drought in 2000, even though it bears risks including price volatility and negative environmental impact. Despite the downsides, it’s likely that oil will continue to be an energy source in Kenya for the foreseeable future as oil was recently discovered in the country. The government is making a conscious effort to increase dependence on renewables other than hydroelectric, as we’ll discuss in our next post. Kenyans are renowned culturally for their willingness to embrace new technologies. In fact, Intel created the “Technology Metabolism Index” showing how technology diffuses through the total population of a given country once introduced. Kenya received a +5, the highest possible rating for diffusion of new technologies. This is reflected in Kenya’s speedy adoption of mobile phones and small-scale (<20 Watt panels) solar home systems for off-grid rural solutions. Kenya has the largest private sector-dominated solar PV home systems market in a developing nation, with annual growth rates of 10- 20% in recent years, according to the World Trade Organization. Overall installed capacity of renewable sources has increased on average 5% per year since 1980, on par with overall increases. Geothermal, bagasse, and small hydro demonstrate assured potential capacity levels, as shown in the chart below with numbers from SREP. Solar, which is variable, has some of the highest levels of solar irradiation in the world (approaching 6kWh/m2) due to Kenya’s proximity to Equator. Similarly, the elevated lands across the West and surrounding Nairobi, along with Lake Turkana and Lake Victoria, provide significant opportunity for wind energy, with average speeds reaching as high as 10m/s. Understanding the benefits of renewable, Kenya has integrated pro-renewable energy tools into its National Policy Documents and its long-term strategic plan for development Kenya Vision 2030. For Kenya, relying on renewables is a way to ride the wave of innovation, increase eco-tourism, supply energy to its people both on-and off-grid to stimulate economic development, and work toward achieving Millennium Development Goals. Next week, we’ll discuss the policy tools that the Kenyan government is using to facilitate the adoption of renewable energy, and what that means for the market. Note: Data is graphs was obtained from World Bank.